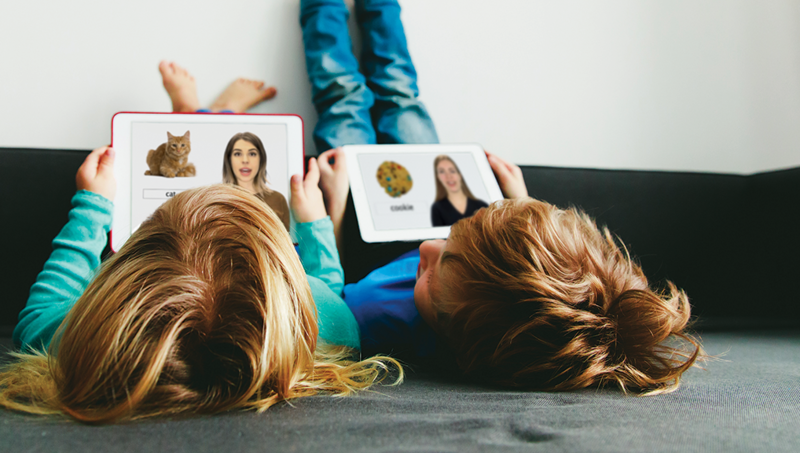 With Gemiini Mobile for Android, iOS, and Kindle, you can stream video assignments on-the-go, or download them directly to your mobile device to play back even when you don't have a connection to the internet. The new Gemiini Mobile offers a stable experience that synchronizes with the full website, and you can even associate more than one account with the same device! We've also introduced a new Playlist feature in Gemiini Mobile. Each student has access to a fully customizable assignment playlist that you can fill with a group of assignments you'd like to play one after another. This is great for long car rides, or if you have a student who is working on more than one assignment at a time! Open the App Store on iOS, Google Play on Android, or Amazon's Appstore on Kindle Fire. Select the option to download the app. With Gemiini Mobile you can stream video assignments, or download them to your device to play when you don't have a connection to the internet. Log in to Gemiini Mobile with a managing or student account. Select the assignment you would like to play. Select the orange Play button. Select Yes to approve the download. By default, assignments can only be downloaded over a wi-fi connection, but you can change the settings to allow downloads over a cellular connection as well. If you have downloaded an assignment to your device, you will see the word "yes" next to the "downloaded" status of the assignment. Select Yes to approve the removal. Use the playlist feature to arrange multiple assignments into custom playlists for your students. Select the + Playlist button. Select Yes to download the assignment and add it to the assignment playlist. Reorder assignments by touching and dragging them. Select the Trash button to remove an assignment from the playlist. Clear the playlist by selecting the remove all button. You can log in to Gemiini Mobile with a managing or student account. Managing accounts can access a few features that aren't available to students. View the list of assignments for each student you're connected with. You can also view each student's Language Pyramid progress. Multiple Users on the Same Device! You can log in to Gemiini Mobile with multiple accounts on the same device. This simplifies switching between managing and student accounts. Enter the user's log in credentials. Select the username of the account you would like to access. You can change the settings of Gemiini Mobile to toggle cellular downloads and streaming, and to change whether downloaded assignments can be removed from the device. Toggle Allow Cellular Downloads to change whether the app can download video assignments over a cellular connection. Toggle Allow Cellular Streaming to change whether the app can stream assignments over cellular. Toggle Allow Assignment Removal to change whether downloads can be deleted from your device. Gemiini Mobile is in active development, but for now there are many functions that must still be performed from our website. Access QuickStart videos, My Videos, the Video Builder, and all Tools. Play assignments from Gemiini Tools. Assign videos and access archived assignments. Gemiini Mobile does not support casting, but many devices can connect to an external display through an HDMI cable. At the time of this article's publication, there is also a Gemiini channel available for Roku, and we have plans to develop channels for Apple TV and FireTV. How Much Gemiini Should My Child Be Watching?